Today, the Russian Navy is on its way to becoming a leaner and more potent… version of its former Soviet self, capable of carrying out any task in defense of its country. By doing so, the Russian Navy has finally found its mission. Considering Russia’s immense and tragic experience with warfare, such an accomplishment is no small feat. Especially in the absence of a coherent navy specific doctrine. This statement is in keeping with what Martyanov sees as his book’s key mission, to assist his native country in defending its national sovereignty, which entails acting to prevent a nuclear world war. 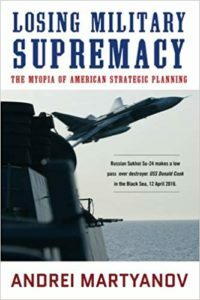 As he states in the conclusion of his book, Losing Military Supremacy: the Myopia of American Strategic Planning, he is most worried that it is the United States that will pull the triggers to set off world war III. “The main task today is to prevent by all means any possibility of this delusional, self-proclaimed exceptional nation unleashing Armageddon because of frustration with its own weakness…” so well exposed by now. Martyanov refers to the fact that despite all the hubris, the US has failed to win most of the wars it has started since WWII. Korea was a stalemate. It lost to Vietnam/Cambodia/Laos. Afghanistan will never be conquered. The victory over a much inferior Iraqi military largely destroyed the cradle of civilization and left nearly all its people hating the US. The current government wants the US out of its country. The US got rid of Libya’s leader Gaddafi only to be replaced by three internally fighting self-declared governments, whose extremist Muslims wantonly murder, smuggle and enslave people. The once richest people in Africa are now among the poorest. The US has divided people in Syria, and Ukraine where they placed a neo-fascist coup government in power. The US’s military thinks in offensive weaponry much more so than in defensive ones. It couldn’t even defend its most hallowed buildings, including the Pentagon, from 19 terrorists in 2001. Seventy percent of military funding is aimed at fighting wars abroad to take other lands’ resources. Martyanov shows us with facts, documentation, and policies that the US has always been at odds with the very existence of Russia, the world’s largest country with self-sustaining resources. It has lied that it was the victor in WWII, alongside with Britain. All evidence points to the contrary. The victorious Russian military defeated the Nazis on the Eastern Front and moved into Europe as the main force. Russia also aided the US defeat the Japanese by sending nearly a million troops to Hokkaido, keeping its promise to President Roosevelt. …if the czars still reigned in Russia, that if Lenin had died of the measles at an early age, that if Stalin had never been heard of, but the power of the Soviet Union were exactly what it is today, the problem of Russia would be for us by and large what it is today. If the Russian armies stood exactly where they stand today, and if Russian technological development were what it is today, we would be by and large confronted with the same problems which confront us today. Regardless of the crimes of Stalin against many of his people, he stood for “socialism in one country”, and the “containment” policy of US governments during the Cold War, which was started by Churchill and Truman not Stalin, did not bother the Soviet leadership. Throughout the world where there were uprisings against tyrants and struggles for socialism, the Soviets always cautioned them. In contrast, it was the US that extended its territory in a neo-colonial manner, what we call imperialism, not necessarily by occupying land but by controlling the resources and foreign policies of much of the world, including the former European colonialists. The Soviet Navy, like the modern Russian Navy today, was built largely for a single purpose: to prevent a NATO attack on the USSR from the sea. Power projection in its classic, US Navy interpretation, was the last thing in mind for Soviet strategists. There simply was no intent to start a war; the intent was to prevent it. Russia does have the capability to deal major damage to NATO’s European members but, apart from Article 5 of the NATO treaty, which would bring the United States into the conflict, even if there hadn’t been such an article, the immediate question is: Why would Russia attack or damage European countries which are worth way more for Russia free and prosperous than they would be if damaged and theoretically, subjugated? To achieve the needed capacity and public support for such an intent [war], the United States needs to run a very tight routine. It has to simultaneously present, sometimes by gross inflation, a set of threats to itself…while nonetheless insisting on American overwhelming military superiority over any power. It is a very schizophrenic policy requiring a constant reconciliation of opposites: If one claims itself to be almost omnipotent militarily, as the US does non-stop, it is really difficult to prove that one is also and simultaneously very vulnerable. In some psychiatric sense it is very close to the more specific Russophrenia phenomenon, where Russia is simultaneously about to collapse and about to overtake the US, and the combined West. It is a classic Orwellian scenario from Nineteen Eighty-Four, which also involves such ideological imperatives as hate sessions and public affirmation of one’s loyalty to the powers that be. The list of America’s military interventions in the last 70 years is unrivaled. It is no surprise then that the US consistently tops a wide range of global public opinion polls as the main threat to the world peace. No other nation can undertake such a massive range of wars all over the globe as does the US. The chronic lying that politicians and the mass media spew forth, such as engaging in and winning wars in the name of human rights, continue undiluted. Today, it is the Trump government that claims victory over IS in Syria when, in reality, the US did little to effectively fight IS or al Qaeda. Rather it was the determination of the Russian government and military not to allow Syria to fall into the hands of those terrorists that did the job. When the US military did engage in fighting these extremist terrorists they worked at cross purposes. The scenario of competition between the US army and navy, and the military vs. the deep state CIA often resulted in one group of US-supported terrorists fighting another US-supported group of terrorists. The whole foundation of russiagate is also based on lies. When Vladimir Putin became president he, like his drunken predecessor Boris Yeltsin, sought to be friends and even an ally with the US. Putin even discussed with George Bush the possibility of Russia coming into NATO and EU, which US deep state leaders rejected. Nevertheless, Putin offered Bush his support in his war against Afghanistan. The one key difference between Yeltsin and Putin was (is) that the latter acts to reverse the disastrous economic policies of the Yeltsin-Clinton team, which raped Russia of its gold and resources (increased poverty from 1.5% to 50% of the population), as Putin acts to regain national sovereignty with a robust capitalist economy in which the rich actually pay taxes . Bush rewarded Putin by abolishing the all-important Anti-Ballistic Missile treaty made by another Republican conservative, Richard Nixon, and Soviet leader Leonid Brezhnev, in 1972. Bush also allowed the CIA to stir up terrorist conflicts in Russia’s area. Putin saw that US foreign policy is built on military supremacy, so he set forth a policy of rearming the Russian military to defend the country against any aggressions launched by the US. Already the next year, 2008, he let the US know that Russia would not allow it to bring Georgia or the Ukraine into NATO, thus surrounding Russia all the more. Russia didn’t attack Georgia first, another US lie. Even the former National Security Adviser and Secretary of State Condoleezza Rice later admitted that it was Georgia, which started that war. South Ossetia and Abkhazia were independent states that Georgia President Mikjail Saakashvili attacked, killing many of them and some Russian troops before Russia fired backed. The Russo-Georgian War showed that Russia’s conventional military power mattered. Russia sent an army to Georgia of equal size to Georgia’s, which had been poorly trained by the US/NATO, and defeated it in four days, in August 2008. Besides the issue of NATO alliance, the US wanted to use Georgia as a pipeline for oil as it demanded with Afghanistan, and tried with Syria, in 2009. Taleban said no, and the US invaded. Assad said no, and the US organized a rebellion against Assad in 2011. It got its pipeline through Georgia in 2005—piping crude oil from Caspian Sea to the Mediterranean Sea. But the US is never satisfied, that’s what “globalization” is all about. The most unique aspect of Martyanov’s book in relationship to many other informative, truthful books coming from alternative publishers about Russia/Soviet and US relations, is that this military expert analyzes the military forces of both countries and shows who has what capabilities militarily. Putin’s message was clear: “You didn’t listen to us then, you will listen to us now”. suppressed communications and computer networks. “3) The US will encounter combat technologies not only on par but often better designed and used, from armor to artillery, to hyper-sonic anti-shipping missiles, than anything the US military has ever encountered. military power—its Air Force—much less effective. I do not have the knowledge nor the space to detail and judge the many weapons that Martyanov includes in his book to show that the US is not capable of winning a conventional war, or that many weapons Russia has are aimed at preventing US weapons from reaching their goals. Here is but a taste of what the author tells us Russia is capable of doing with its modern weapons. “Only 14.7% wanted allied relations with the US. The US is simply no longer attractive as a model, whether economic, cultural or social, in Russia and the majority of Russians view the United States as a very real threat,” Martyanov concludes. This article was posted on Thursday, April 4th, 2019 at 4:14am and is filed under Book Review, Militarism, Russia, Weaponry.